Replace or supplement your Amazon Kindle 2 power adapter with a spare. This adapter is the same as the one that ships in the box with your Kindle 2. Simply plug the adapter into a wall outlet and connect to your Kindle 2’s micro USB port for recharging. Its universal design means that it works around the world, with the help of a physical country adapter plug (sold separately). 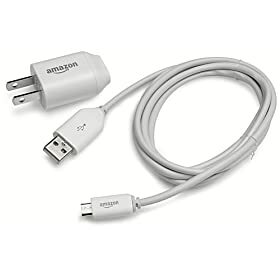 The power adapter’s detachable USB cable can be used to connect your Kindle 2 to a computer or USB hub for either powering your Kindle through the computer or for transferring MP3 or Audible files onto your Amazon Kindle 2.